​Hungarian guitarist, Melinda Toth was born in Pecs and started her musical education at the age of five under the instruction of her father. After finishing the secondary school of Arts she moved to Budapest to study with Jozsef Eotvos at the Liszt Ferenc Academy of Music from where she received her Bachelor and Teacher's degree in 2005.In 2004 she was awarded a 6 months Erasmus scholarship to study with Antigoni Goni's class at the Royal Conservatory of Music in Brussels. After graduation in Budapest she returned to Brussels and joined the Masters program of the Royal Conservatory where she graduated with great distinction in 2008. 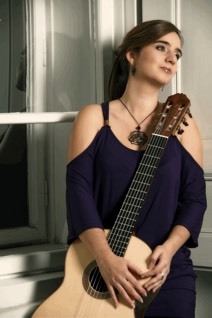 In 2010 she was one chosen member and a scholarship holder of the 6 months Tuscan Guitar Academy in Pontedera. During her studies Melinda has attended several masterclasses /given by David Russel, Marcin Dylla, Oscar Ghiglia, Zoran Dukic, Carlo Marchione...among others/ and has successfully performed in national and international competitions. In 2010 she was chosen for an italian concert tour at the Young guitar performer selection as the winner of the Paganini competition in Parma. She had concerts in Hungary, Belgium, Luxembourg, Germany, Austria, England and Italy. She regularly plays also chamber music in various constellations.As member of a guitar duo she had a chance to play in the Belgian Parliament and to represent Hungary at the European Culture Week. With belgian flutist, Elisabeth de Merode, their first CD -The History of Tango- was recorded in 2009 with spanish and latin-american program. ​Melinda plays on a Noel Callaert guitar.